StreetShares Inc., the mission-driven financial technology startup, announces the relocation of its National Capital Region headquarters to 1900 Campus Commons Drive #200 in Reston, Virginia 20191. From January 2018 to August 2018, StreetShares doubled the size of its workforce and additional hires are planned. 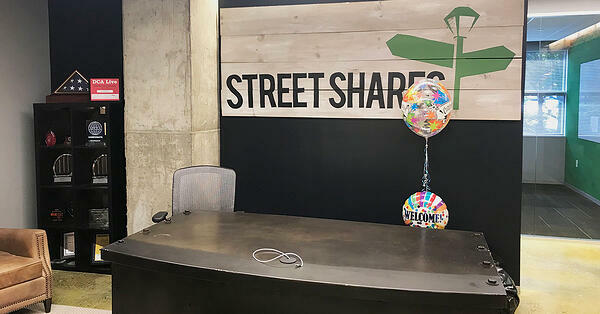 To accommodate this growth, StreetShares is expanding its footprint by more than four times, to more than 10,300 square feet at its new location. The company began in a residential basement, before spending the past 4 years in Isaac Newton Square in Reston. The new office reflects StreetShares' characteristic open "fintech" culture. "No cubicles or offices allowed," says CEO Mark L. Rockefeller. "Standing desks, teams working together in pods, as well as glass, metal, and exposed concrete reflect a technology startup. And vintage World War II posters and an enormous American flag remind our team of the special members we serve." The new office is the third big announcement from StreetShares in the past 6 months. StreetShares raised a $23 millionSeries B equity round in January and won Ernst & Young Entrepreneur of the Year award (Mid-Atlantic) in June. StreetShares offers unique financial solutions for America's heroes and their communities. StreetShares' technology captures the social loyalty that exists within the military community and harnesses that trust to lower risk in financial transactions. StreetShares provides a suite of specialty finance products focused on the military and veterans market, including small business funding, lines of credit, and alternatives to VA small business loans for vet-owned businesses. StreetShares offers invoice factoring and account receivables financing for the government contract (GovCon) community, as well as the StreetShares Patriot Express® program. StreetShares offers alternative investments, including a veterans social-impact investing product called Veteran Business Bonds. StreetShares is veteran-run and located outside of Washington, D.C. To learn more, please visit: StreetShares.com.